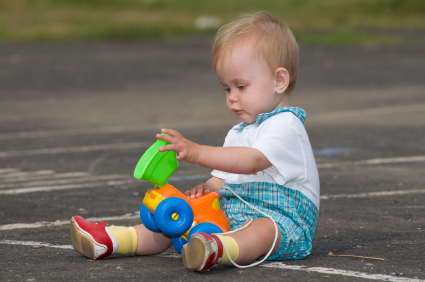 Slow Down - There May Just be a Toddler on the Curb! Down - There May Just be a Toddler on the Curb! Since I was up most of last night haunted by images of what I experienced yesterday I figured it might be therapeutic to get my story down on virtual 'paper'. And my story is definitely relevant to this site since it may convince you to be safer on the roads and avoid speeding the next time you find a great car rental deal and cruise the streets. It was late afternoon and I was driving down a relatively busy street towards my house. I was traveling fairly slow since the city is currently doing quite a bit of construction work in the area. As I was driving along I noticed out of the corner of my eye a little toddler standing on the curb, inches (and I mean inches!) from the street, with his plastic push car. I slowed down even more, looking in earnest for the adult who should have been holding his hand. But there was no one. I pulled over as much as the narrow lane would let me, flew out of my car and hoisted the little sweety onto my hip as the vehicles behind me started to pile up. Were they mad? Probably (they likely thought I was some lunatic who decided to stop just because...)! But I didn't care at that point, my heart was racing so fast. Where should I go? What do I do? My first thought was to call the police but then I noticed that the gate to the house right in front of me was open. I took the little guy with his play truck to the front of the house, screaming, "hello, hello". A woman came running from her backyard with fear etched all over her face. She saw me and came running over, on the verge of collapse. Thank goodness this story has a happy ending. It has struck home though the extreme importance of driving safely, alert and slowly. The outcome of the story could have been devastating. Let this be a lesson to everyone - the next time you find great car rental discounts, rent a vehicle and enjoy - but be careful. There may just be a little person standing, lost at the curb.